"Je souhaite que l'on utilise un preservatif. Un preservatif, pourquois pas! On peut essayer. Le preservatif: c'est la security. Le preservatif, c'est un dialogue a deux." I want us to use a condom. A condom, why not! We can try. Condoms: it's security. Condoms, it's a dialogue with two." 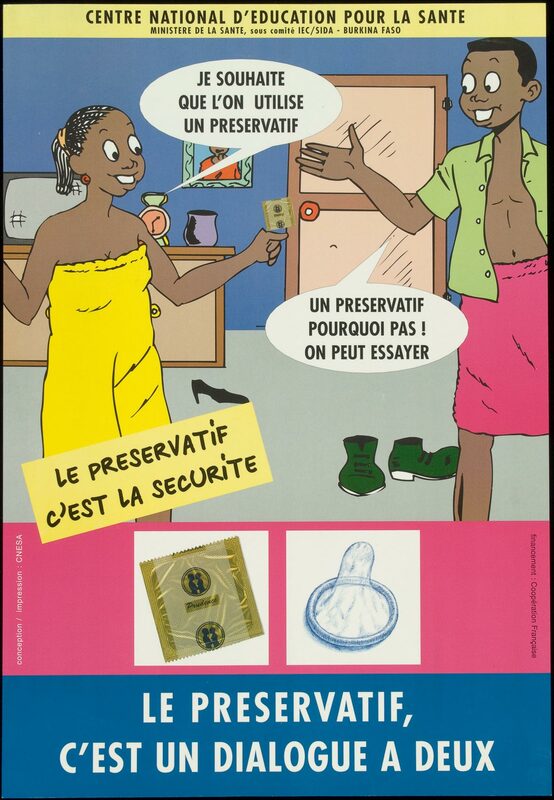 Illustration of a man and woman in a room, she is holding a condom package. Two photographs showing a condom package and a partially unrolled condom appear near the text. Burkina Faso. Ministere de la Sante. Sous comite IEC/SIDA. Centre national d'education pour la sante.